Taylor Swift has always been a controversial figure in the music industry. For one thing, her parents are enormous sponsors to her career, what with her grandfather from her mother’s side being an oilman, and her father being a wealth management advisor and senior vice president at Merrill Lynch. Furthermore, it’s never really clear whether or not Swift writes her own music. I mean, it’s no big secret that her songs seem to beinspired by real-life events ("Dear John" being an ode to ex John Mayer and "Forever and Always" about another ex Joe Jonas). But all those catchy tunes? Can one 24-year old girl really claim all the rights? Anyways, her recent tiff with Spotify is striking a chord with listeners and musicians all around the world: according to Swift and her label Big Machine, the popular streaming app doesn’t pay her what is rightfully hers. MACO, a Hakodate (Hokkaido) native, has been writing songs since the age of 17. It wasn’t until 2013 that she was recognized by her current label ONEPEACE, who also manages Matt Cab and tofubeats. Her videos have something like 6 billion views onyoutube. 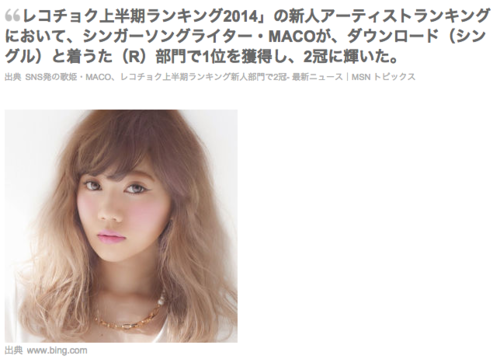 MACO’s released 2 albums (this will soon be 3, because her upcoming album 23 Pluswill be released on November 26th) and 1 single. Both 22 and 23 feature Matt Cab. We should be expecting a lot from her in the near future. You can find her in the links above on iTunes Japan, and iTunes Japan gift cards is available through JapanCodeSupply. If you don’t want a full album, but a few songs stuck with you, then purchase your recochoku credits with JapanCodeSupply! Remember: Taylor Swift wants you to support artists, because art is rare.